Well friends, it is Christmas Eve. That means we are at the end of Blogmas. I will not be publishing a post tomorrow, because I will be spending the rest of today (Christmas Eve) and tomorrow celebrating the holiday. I figured I am long overdue for a day off from posting. Don’t worry, I’ll still be on social media. 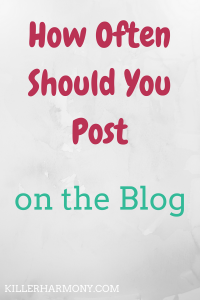 Anyway, this post will be all about how often you should blog. I figured that since I did do Blogmas, and I stuck it out until (almost) the bitter end, that I should share what I learned. It takes a lot of work to publish a new post every day, especially a good quality post. Here are some things I learned from going from one blog post per week to one post per day. I hope these things help you figure out how often you should blog. I learned that the accountability in promising that I would post something new each day on this blog was a great motivator. I told anyone who has access to the internet that I would publish a blog post every single day, and I did. That external motivator was awesome, but internal motivation is important, too. I had to motivate myself, specifically during finals week. I had to study, but I didn’t want to neglect blogging either, and I think doing something for the blog daily was the best thing I could do. 2. Good post ideas have something of value. I like writing personal posts occasionally, but I need to include some sort of value for you reading the post. I can’t just write a diary about my day; that’s not interesting. It is not easy to write a post, optimize it for different platforms like Google and social media, publish it and then promote it. Even with scheduling tools for posts and social media, it still takes time to schedule stuff to post. You can’t just write a blog post and expect it to go viral anymore. That’s not how the internet works. You have to make sure you are posting good content that people want to see, and you have to somehow get it in front of those people. In the online world, your visuals can make or break someone’s first impression of you. The look of your blog, social media profiles and post graphics are super important for having a successful blog. If you didn’t notice, I added a new color to my blog’s style this month. While I do love turquoise and grey, the blog needed something else. I found a nice complementary maroon that looked great with the colors I had in place, and I am obsessed. I also streamlined my blog graphics, and I hope to spend some time in the near future updating the graphics from before I made the change. Some people prefer to work in batches. They will write all of their posts at one time, design all of their graphics at another time, schedule social media at yet another time and so on. I have found that I like to work on a post and all of its parts in one go, if I can. I sit down and write the post, make sure it is optimized for search engines (thanks, Yoast! ), create the graphics and schedule it for the appropriate time. 6. I truly love blogging and all that comes with it. Going through my entire blogging process each day really made me love what I do. I love writing posts, editing them, creating graphics, working on search engine optimization (SEO) and promoting my blog. In fact, I might have something in the works that can help you and your blog…hint, hint. Stay tuned for more information. How often should you blog? Blogging daily is one option. It is not something I would do again, at least not until next December, but I did enjoy it. I love getting to share things I have learned with my readers, and that is why I am working so hard to make this blog successful. I will probably move to about two posts per week. As I said, I really nailed down my process this month, and I will have more time in the next few months to write more. Have you written or blogged daily? What was your experience like? Let me know in the comments! Also, be sure to catch up on my latest posts and follow me on Twitter (@HannahHaefele) so you don’t miss future updates!